Up until a month ago, I had never tried a blood orange. I’m not crazy over regular oranges, but I think the deep red color of a blood orange has always intrigued me. At my local market, I saw that they were selling blood oranges and the next week they were on sale. I bought a few and had no idea what to do with them, so they ended up going into some homemade sangria over the holidays. This time when I bought some, I decided they would be the main ingredient in a fresh drink. 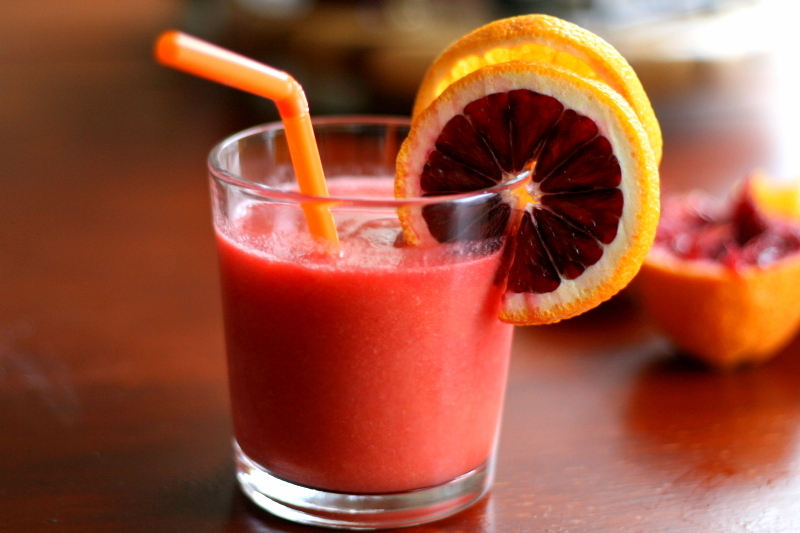 Blood oranges are in season during the winter months, so now is the perfect time to pick some up. While they don’t sell them at my local grocery store, I was able to find them at a specialty produce market in town. 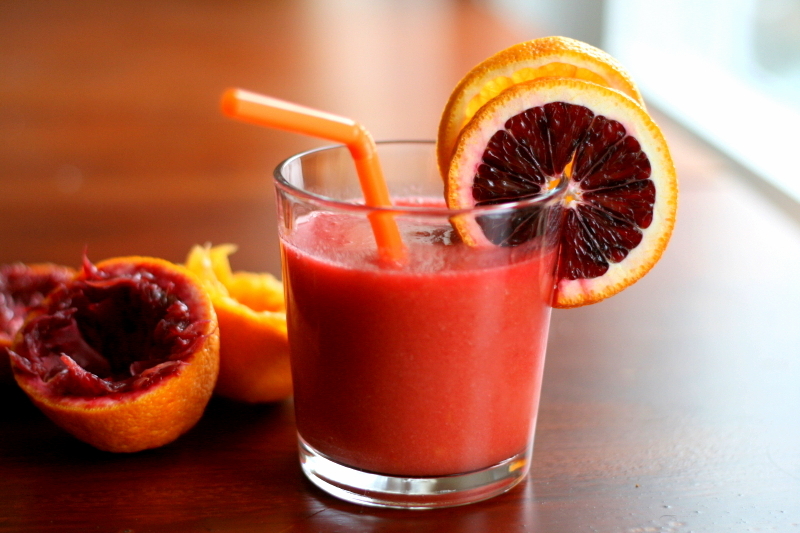 Blood oranges are slightly more tart than other oranges and have a more intense citrus flavor. The juice is a beautiful color and I thought it would be especially appealing in a healthy smoothie. 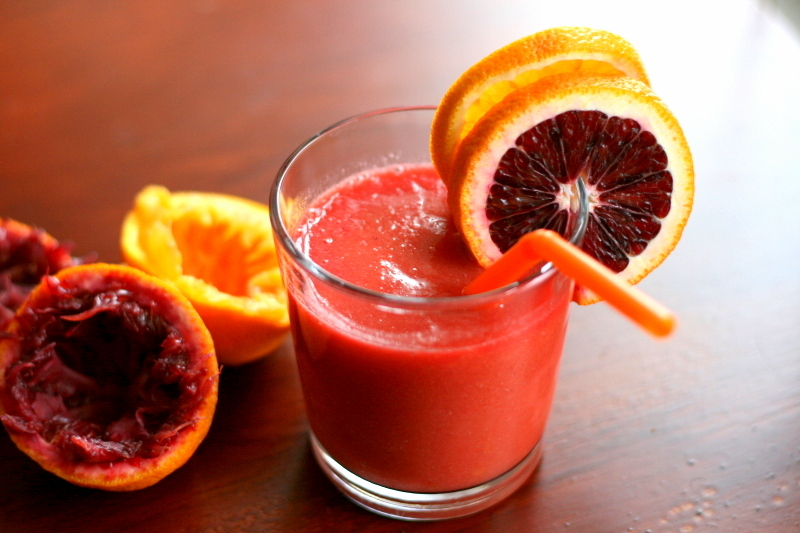 This Blood Orange Smoothie combines fresh blood orange juice, frozen peaches, and bottled orange juice. 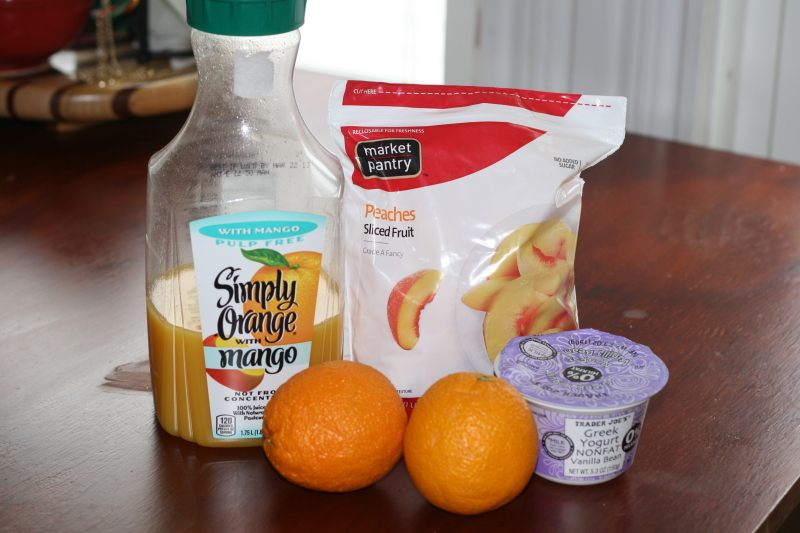 You can also add some vanilla Greek yogurt for a creamier consistency and for extra protein. This smoothie is refreshing and full of citrus flavor, and the boost of vitamin C will help to lift your spirits a gloomy winter day like today. I would have to say it’s one of my favorite smoothie creations yet! *I didn’t use the yogurt and I would also like to note that I added a small handful of frozen raspberries to achieve a more vibrant color, but they are not necessarily important for this recipe. 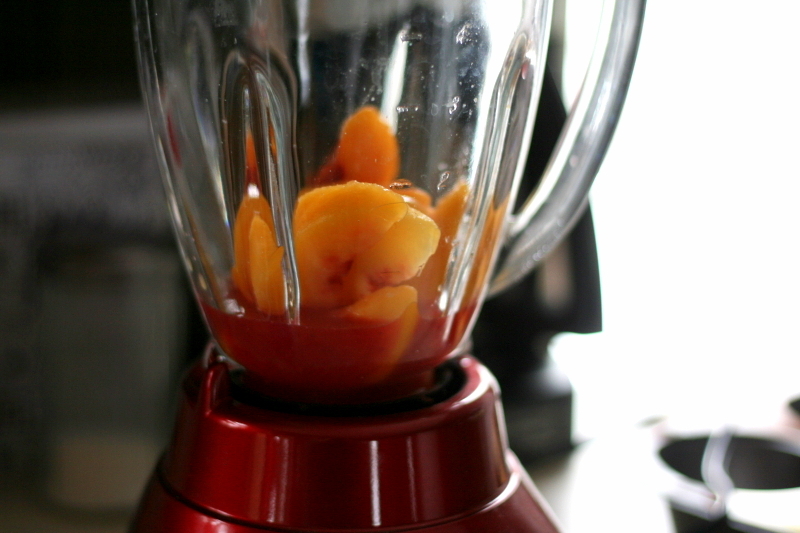 Simply combine all ingredients in a blender and blend until smooth. 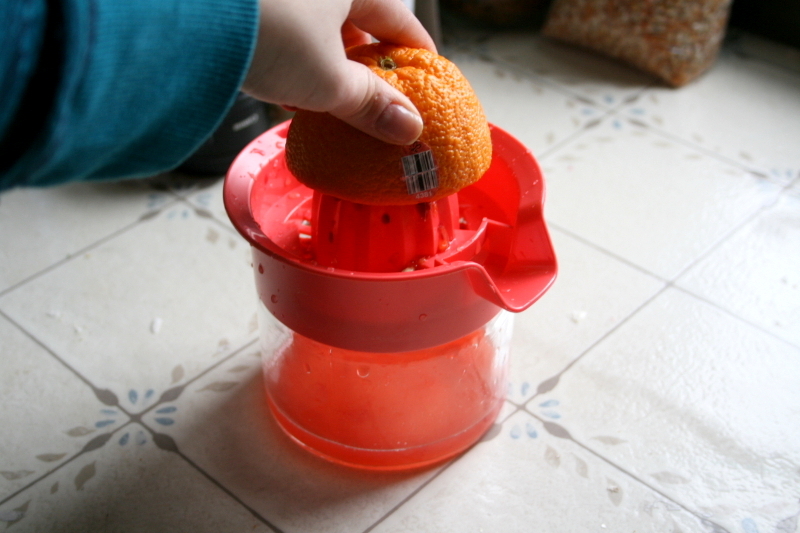 Use a juicer or simply squeeze the oranges to get as much of the juice out as possible. I got this cute little juicer on sale at Target for $2! I LOVE blood orange anything. This looks and sounds amazing! This is really beautiful! I’m a huge fan of blood oranges, and am ecstatic that it’s blood orange season.